A simple and easy to use jig for cutting perfect arcs every time. Master carpenter Michael Kordyak has this to say about his arch cutting jig. Being a contractor and craftsman of 34 years I developed my arch cutting jig out of necessity. Being a professional I do not like a cheap tool that does not work. This tool Works and it works good. Never before has there been a tool that can cut a perfect arch every time. It's fast, easy and efficient! 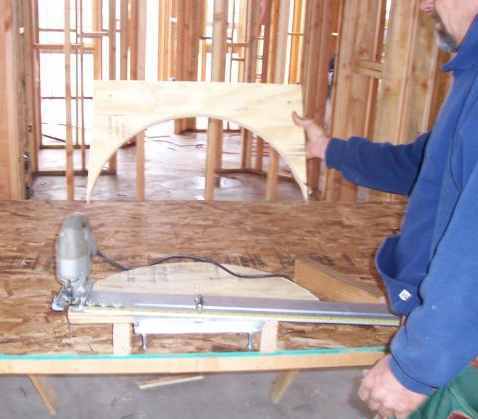 The patented Arch Cutting Jig clamps to the leading edge on any panel, at the desired diameter. The geometry is perfect every time and will adapt to any quality jigsaw that accepts a rip fence. This is a perfect tool for the do-it-yourself home owner, but a necessary tool for professionals. Arch Jig - Quickly finished. 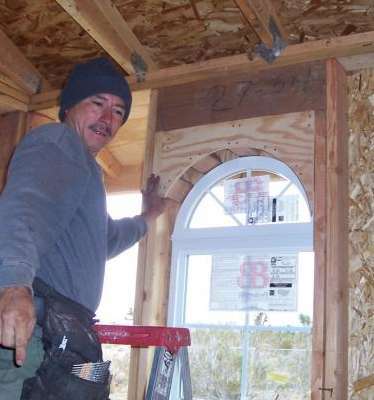 Building any structure with radius walls, radius top windows, circular stair, cove ceilings, radius niches, Radius soffits, exterior arches, Radius finish moldings for interior and exterior siding. I have cut radius templates for Radius concrete stem walls forms, bracing collars for sonotube pillars. One could never cut all this fast with precision by free hand. The expanded model that will cut up to a 10 foot radius. Farther extensions can be adapted for even larger diameters. A must field tool for many construction trades. 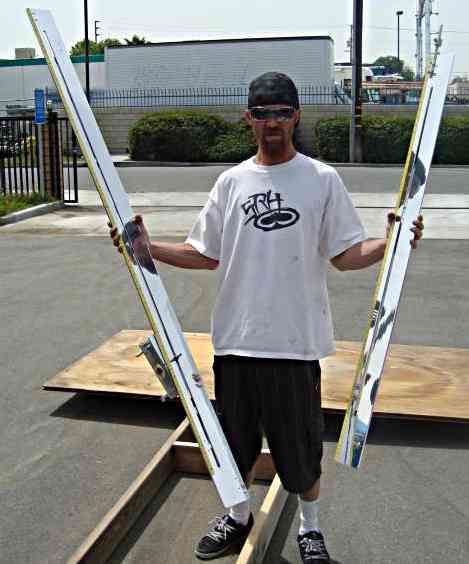 The inventor of the arch cutting jig, Michael Kordyak has his own website and he can be contacted there. I think this is a handy jig that is simple in design and for anyone who cuts circular arcs from time to time then this would be very handy indeed. I did a series of jobs years ago where we had to cut formwork around large diameter pipes in a power station and sewerage pumping stations. I tried to mock up something like this with timber (lumber) and while it worked after a fashion it jammed and the saw wanted to run off. Michael probably had the same problem and decided to do something about it. Good on him! Here is another use for it also. I've made a few centres like the sketch above for bricklayers and as part of wall formwork and a speedy cutting jig would have been very handy for those. Modern jigsaws can handle quite thick material. 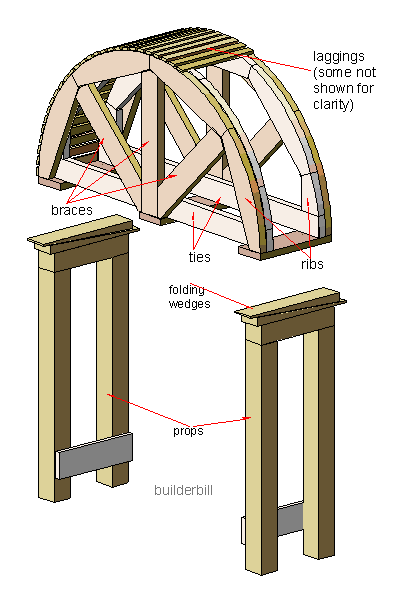 Have a look at Michael's site as he has a video of using the jig to make and fix a widow head framing like the photo second down. It takes him just minutes.